Any serious road warrior in this day and age would definitely find it more or less impossible to get through an entire day without having to plug in their smartphone to a power outlet at one point in time or another. Hence, the proliferation of power banks in our society, where these portable devices are able to provide the necessary boost of juice as and when required. 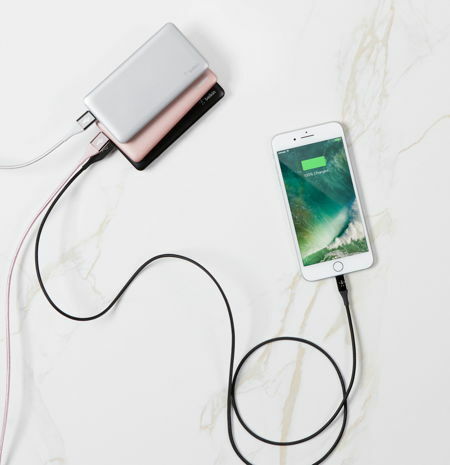 Belkin is long known to be a manufacturer of mobile accessories that will allow one to enjoy a greater degree of automation and convenience, and has just introduced its most compact and fast charging battery pack ever, in the form of the new Pocket Power series. The all new Pocket Power series will arrive equipped with polymer battery technology as well as three tiers of power: up to 15,000 mAh, and will arrive in in Black, Rose Gold and Silver shades. Of course, the other two power tiers would be 5,000 and 10,000 mAh sizes, depending on your needs at that point in time. Do take note that the 15,000 mAh model will be available in black only. With fast-charging capability and polymer battery cell technology, the new battery packs will be a whole lot lighter to tote around, not to mention thinner as well as being better equipped to charge multiple devices without having to break the bank. With consumers spending up to five hours a day on their mobile devices as claimed by Flurry Analytics, while Deloitte figured out that 90 percent of photos shared or stored online will be taken by a smartphone, you can expect a need for a superior battery or portable power solution to arise, and the new Pocket Power line fits the bill perfectly. There are built-in safety features that help to protect the device and the consumer, while the Micro-USB port charges the battery pack in double quick time and efficiently. Each purchase comes with a 6″ micro-USB cable and 4 LED indicators that will showcase the remaining power level. Expect the Pocket Power 5,000 mAh to retail for $29.99, while the Pocket Power 10,000 mAh and 15,000 mAh will arrive later in the year. The Litter Kwitter Toilet Training System – No More Sand!